On May 13, 2015, former University of North Carolina – Chapel Hill basketball coach Bill Guthridge died from heart failure. However, it was Coach Guthridge’s incurable heart condition that led to his development of vascular dementia, and with its progression, his placement for the last several years in a Chapel Hill assisted living facility. 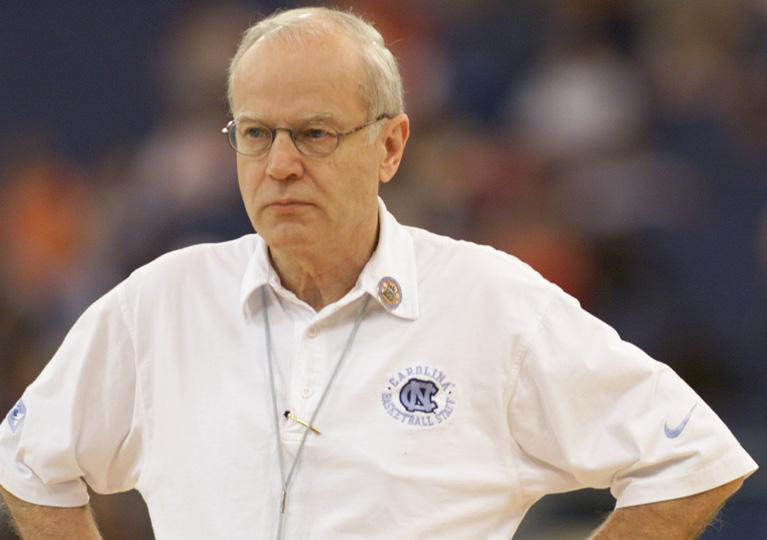 If Bill Guthridge doesn’t look familiar to you as a UNC-Chapel Hill head basketball coach, there’s a very good reason for that. He was and has been overshadowed and a bit lost in the shuffle of UNC basketball coaches by his lifelong friend, former UNC head coach Dean Smith (1961 to 1997), and current UNC head coach Roy Williams, who was an assistant coach along with Guthridge at UNC from 1978 to 1988. However, Coach Guthridge served as the perfect replacement as head basketball coach when Coach Smith unexpectantly announced his retirement from the University of North Carolina at Chapel Hill in 1997. 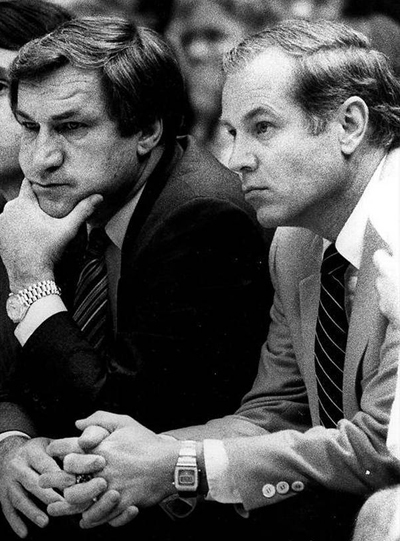 Coach Guthridge had been Coach Smith’s assistant coach at UNC for 30 years, so he knew Coach Smith’s style, plays, and strategies inside and out. Coach Guthridge was the right choice to lead the transition to another, younger leader of the famed basketball program at the University of North Carolina. Unfortunately, it took UNC two tries to find that leader. The university made a huge misstep when it hired former UNC player, Matt Doherty, a young, untested coach in the league of the Atlantic Coast Conference (ACC) and a 180-degree change from the coaching styles of Coach Smith and Coach Guthridge, as its head basketball coach in 2000, when Coach Guthridge retired. 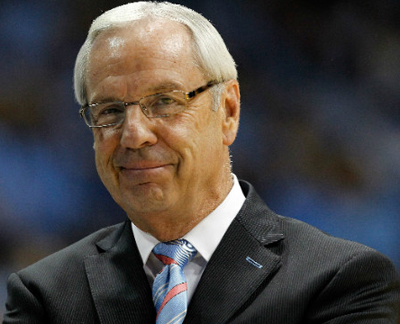 After a three-year disastrous tenure under Doherty, the University of North Carolina hired Roy Williams from Kansas and got the leadership and gravitas that had characterized the UNC basketball program under Coach Smith and Coach Guthridge. After Coach Guthridge’s retirement in 2003, he and Coach Smith stayed in close contact, visiting each other frequently. Ironically, both coaches developed dementia along the way (Coach Smith died in January 2015 of complications from dementia). Coach Smith began showing signs of cognitive impairment before Coach Guthridge did. It was profoundly hard for Coach Guthridge to watch his lifetime friend become forgetful and lose the memories they shared together, not just as the architects of a fantastic and highly-ethical college basketball program, but as friends who regarded each other and their respective families as their own. When Coach Smith died, Coach Guthridge knew that his friend was gone, but he quickly moved back to their time together when they were younger and dementia had not knocked on their doors yet. My guess is that Coach Guthridge probably never came back from that place after Coach Smith’s death and I would speculate that Coach Smith’s death may have been the final straw of an increasingly-unfamiliar and disconnected life for Coach Guthridge. Perhaps, at last, somewhere in his mind, Coach Guthridge finally made the decision to retire from this physical life. Perhaps, at last, somewhere in his mind, Coach Guthridge finally made the decision it was time for him to retire from this physical life. Coach Guthridge made his retirement official on May 13, 2015.